4444 ⊙ 16a 3 Gr. 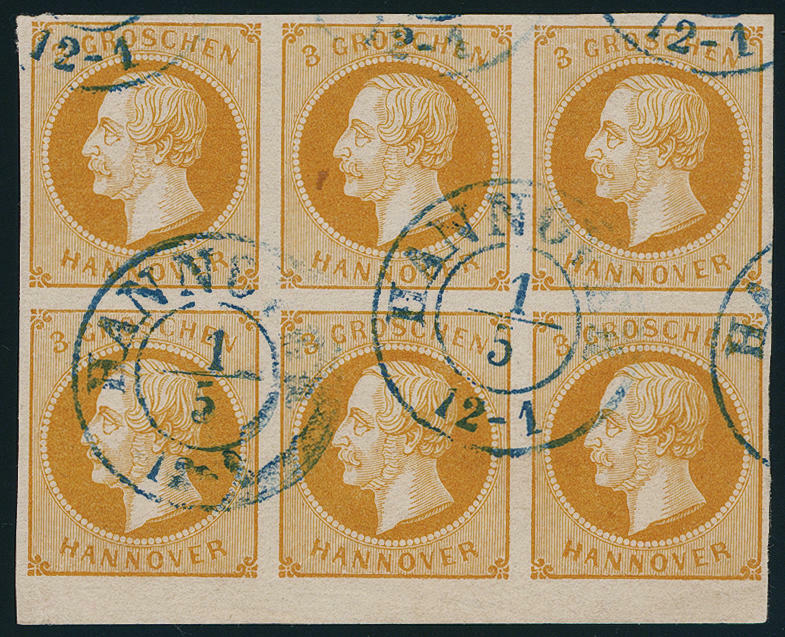 Yellow orange in the vertical block of eight, wonderful fresh colors and large margins all around, insignificant fold trace only in the gap of the lower pairs, clean mounted blue framed cancel of 3 lines \"Hanover\". A particularly beautiful and attractive unit, superb in every respect (choice copy), photo expertize Berger BPP. 4445 ⊙ 16b 3 Gr. 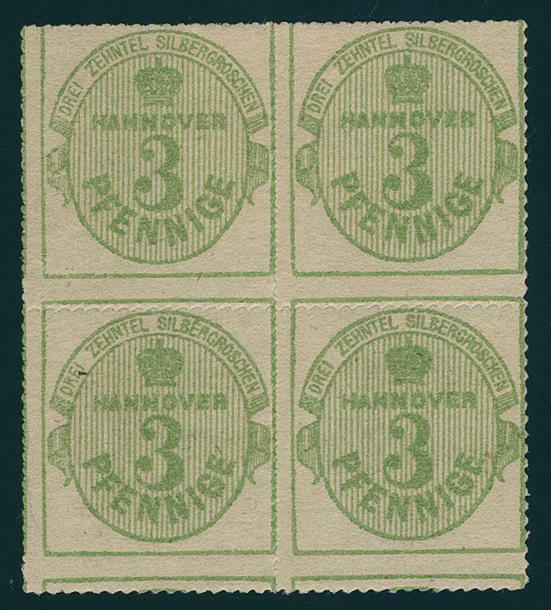 Dark orange, block of six from lower margin, wonderful fresh colors and large margins all around, neat cancelled \"Hanover\". An outstanding quality of this rare unit! Photo expertize Berger BPP. 4446 ⊙ 20 3 Pfg. Green olive, wonderful having bright colors and on all sides piece in outstanding quality with enormous margins, right with large parts of the neighbour with clear blue two ring cancel \"Hanover\". A piece of dream for your highest requirements! Photo expertize Jäschke-Lantelme BPP. 4448 / 21y 3 Pfg. Green, white gum, wonderful block of four, excellent rouletted, fresh colors with full original gum, upper pair with clean small hinge, lower in perfect condition mint never hinged an outstanding quality this attractive unit! 4449 21y 3 Pfg. Olive green, wonderful thirties souvenir sheet, wonderful fresh colors and excellent rouletted, between 1. And 2. 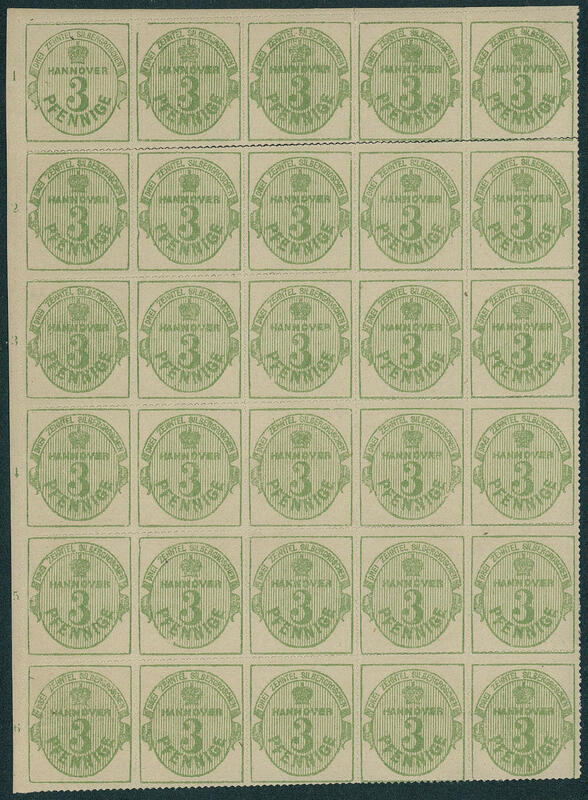 Alignment perforation separated, left with counting numbers 1-6, in perfect condition mint never hinged, without any signs. An especially decorative and in this excellent quality very scarce unit! 4450 25y 3 Gr. 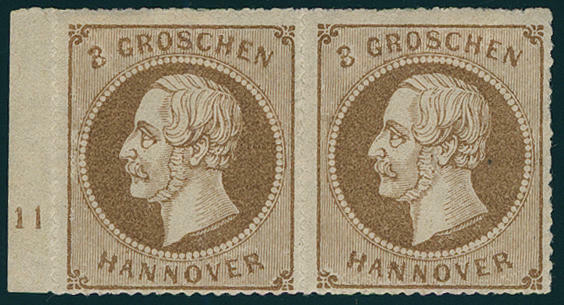 Pale brown, horizontal pair from left margin of sheet with margin figure 11, fresh colors and in perfect condition unused with original gumming. Outstanding quality! 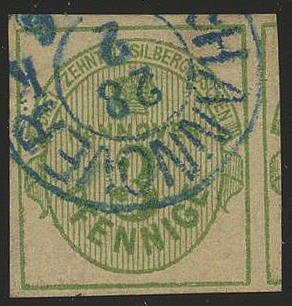 4452 ⊙ 8F 1 / 4 Shilling light green / carmine, the scarce printing error, fresh colors, perforation fault, very neat cancelled with English type of round stamp I from 1873. A sought and nearly always missing issue! Photo expertize Müller. Michel 4500,- €. 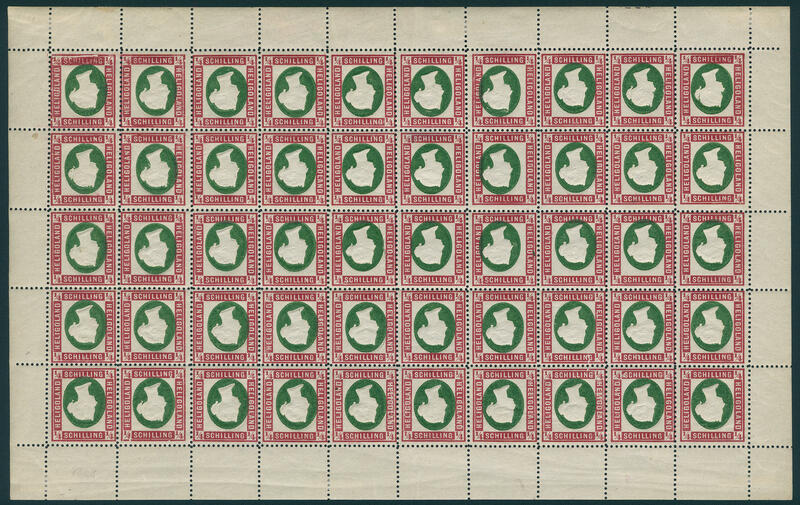 4453 / 8KND 1 / 4 Shilling green / red, Hamburg reprint with inverted centerpiece in the complete original sheet of 50, 11 stamps affixed spots, otherwise in perfect condition mint never hinged, only in the margin of sheet hinge respectively affixed spots. A decorative and scarce unit. There are only still few original sheet of this variety have been preserved! 4454 ✉ 14d 10 Pfg. 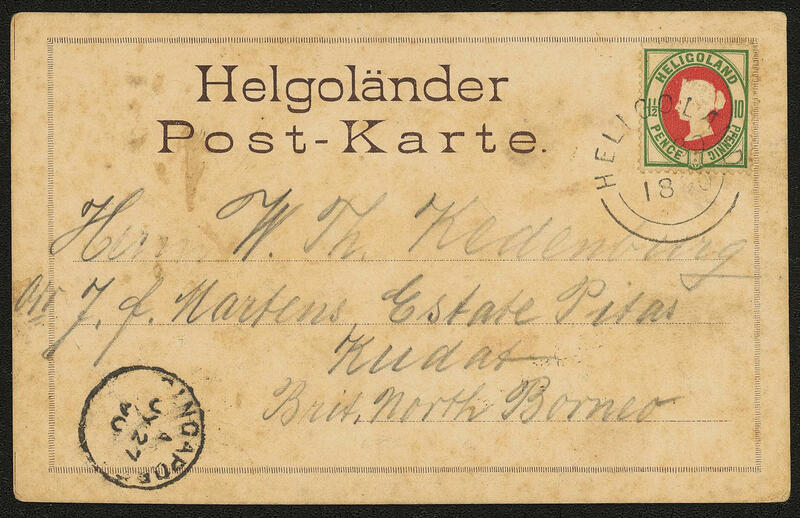 Light green / red, fresh colors, vertical perforation partly not perfect as correctly franked single franking on colored picture postcard \"green is the Country, ROTH is the KANT, white is the sand, that are the colours from Heligoland\", a little patina with neat postmark \"HELIGOLAND\" from 1890 to KUDAT / britisch North Borneo with transit cancellation \"SINGAPORE 27. JY. 90. \". This is the only known document from Heligoland, the to North Borneo was transported. A significant Destinations rarity of the Old German States! Photo expertize Estelmann BPP. 4455 ⊙ 20A 5 Mk. Blue-green / salmon-red / yellow in the horizontal pair, fresh colors with the circle date stamp the English form in type V. Used pairs this high denomination value are very rare! Photo expertize Schulz BPP. 4456 ∆ 20A 5 Sh. / 5 Mk. 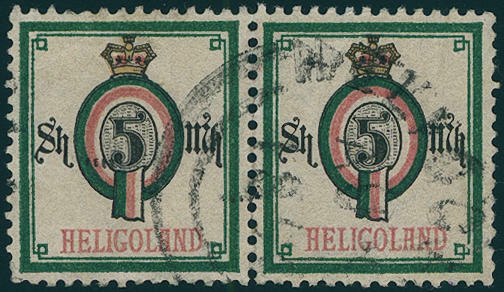 Blue-green / salmon-red / yellow, fresh colors and in perfect condition on very nice letter piece with clear full mounted stamp \"HELIGOLAND 13. JY. 1890\". 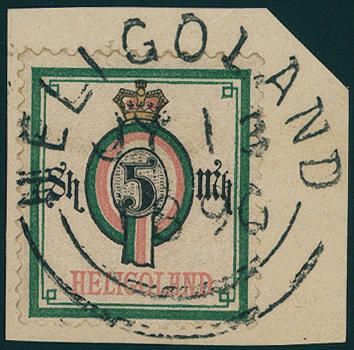 An outstanding quality the Heligoland rarity! Photo expertize \"wonderful piece\" Schulz BPP. 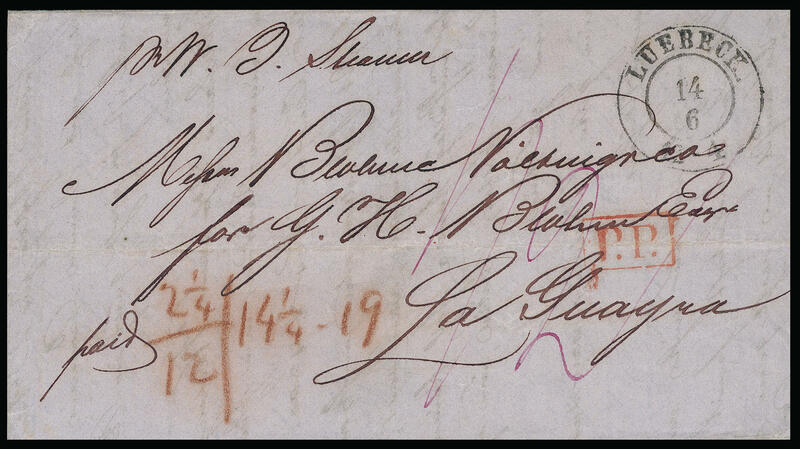 4457 ⊙ 1 1 / 2 Shilling lilac, with exceptional nice and clear mounted five line cancel of the city post office, wonderful fresh colors and good margins in perfect condition. An outstanding quality this Old Germany rarity! Photo certificates Flemming BPP, Mehlmann BPP. 4458 ∆ 01. 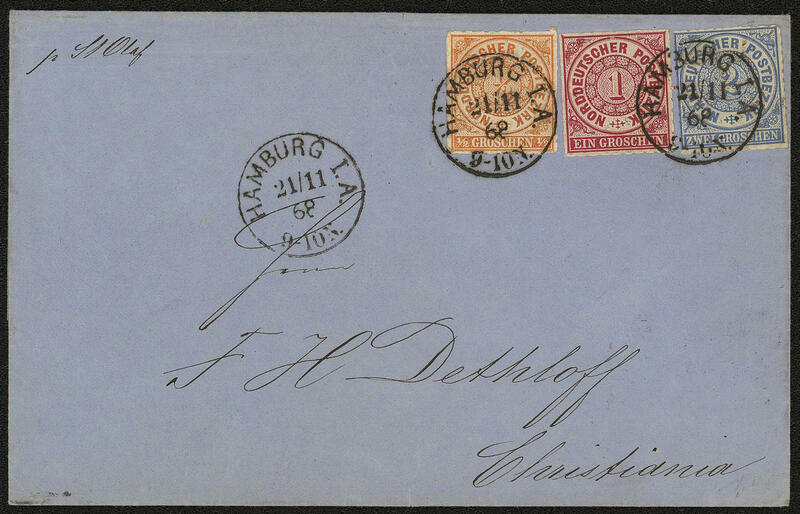 Feb 1 / 2 Shilling dark lilac and 1 Shilling pale orange red, both values wonderful fresh colors and excellent margins as wonderful franking with different colours on magnificent letter piece with clear two ring cancel \"LÜBECK 8 / 1. \". An outstanding quality for the highest standards! Photo certificates Drahn (1965), Hunziker (1966) and Volker Mehlmann BPP (2017). 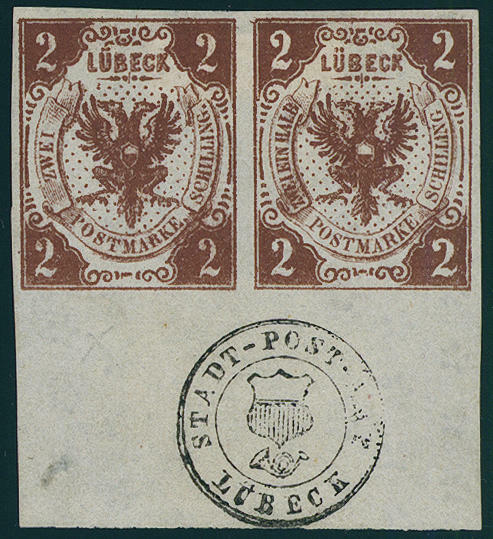 4459 3F 2 ½ S. Reddish brown, the printing error with the normal stamp se-tenant in the horizontal pair from lower margin with three circle cancel \"city post office LÜBECK\" in the margin of sheet, fresh colors and large margins all around, in perfect condition on ungummed paper. Outstanding quality! 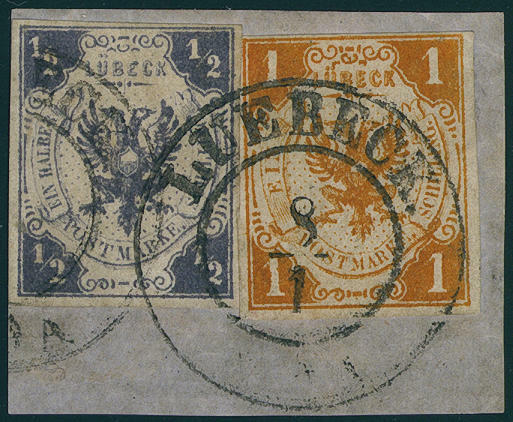 4462 ∆ 6 1 / 2 Shilling lilac, two wonderful having bright colors and good margins items in outstanding quality on very nice letter piece, removed for quality control, with clearly five line cancels and additional two ring cancel \"LÜBECK 4 / 11\". A rarity for the sophisticated Lübeck collection for the highest standards! Photo certificates Brettl BPP (1984), Mehlmann BPP (2017). 4463 ✉ \"LÜBECK 14.6. 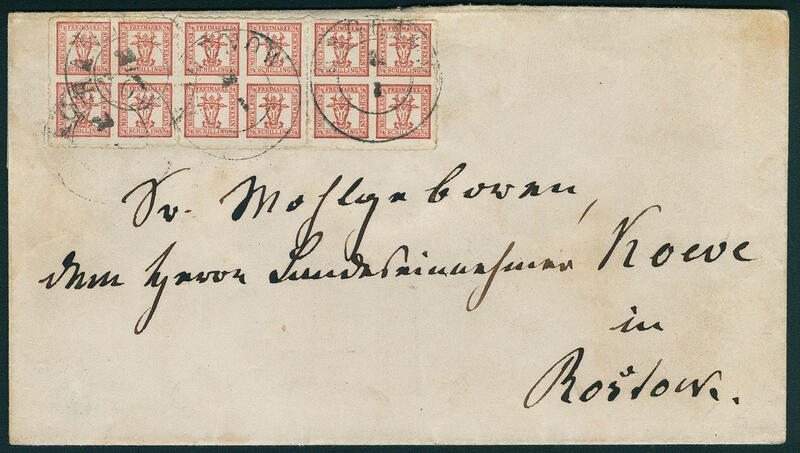 (1864) \", clear on bar stamped international cover with additional red \"P. P. \" to La Guayra / Venezuela with full content. An especially nice mint choice copy letter with rare destination! 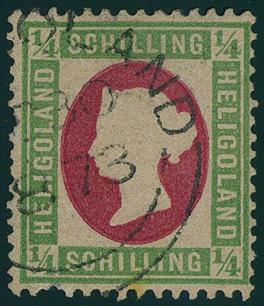 4464 ✉ 5 1 Shilling brick red, horizontal strip of three fresh colors, left at the bottom insignificant puncture notch, as far as in perfect condition on attractive cover as scarce multiple franking with two ring cancel \"HAGENOW 24.3. 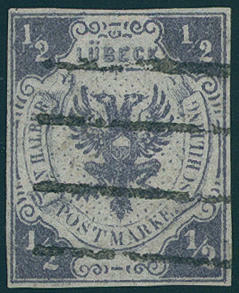 \" to Rostock with on the back posting stamp. A scarce and attractive franking! Photo expertize Berger BPP. 4465 ✉ 6a 2 Shillings dark magenta, fresh colors, at the bottom scissors separation, otherwise in perfect condition as correctly franked single franking on domestic letter from \"SCHWERIN 14.9. 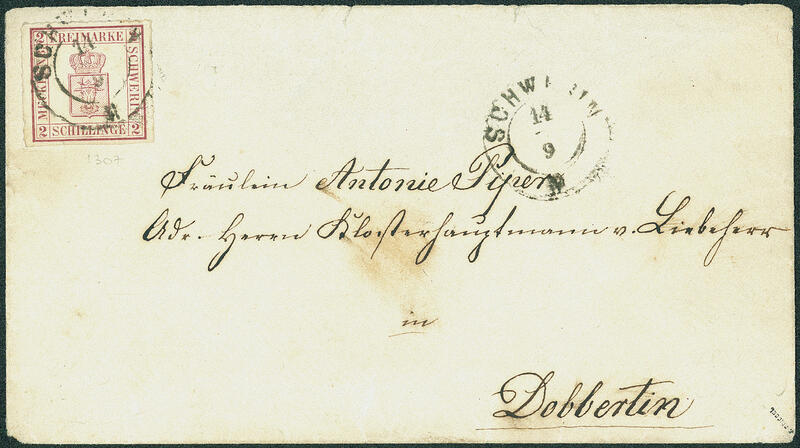 (1867) \" to Dobbertin. Rare! Photo expertize Berger BPP. 4530 ✉ 03. Mai 1 / 2 Gr. Orange, 1 Gr. Carmine and 2 Gr. Blue, all three values wonderful fresh colors as particularly beautiful 3 colours franking on cover with clear single circle postmark \"Hamburg 21.11.68. \" to Christiania / Norway. Outstanding quality! 4531 ✉ 5 2 Gr. Blue, two having bright colors items in outstanding quality on wonderful cover with two clearly horseshoe cancel \"LÜBECK 20.1.68. 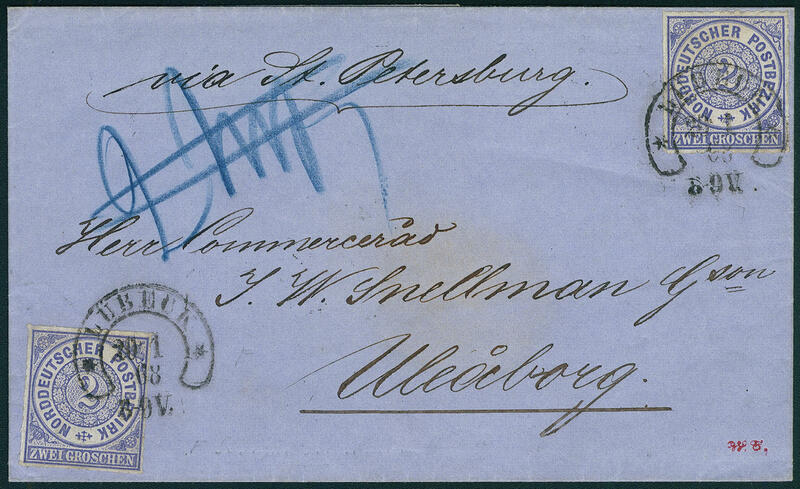 \" over St. Petersburg transported to \"ULEABORG / Finland\" with arrival postmark. An especially nice letter in outstanding quality with rare destination! Photo expertize Spalink BPP.